Product prices and availability are accurate as of 2019-04-25 01:05:09 UTC and are subject to change. Any price and availability information displayed on http://www.amazon.co.uk/ at the time of purchase will apply to the purchase of this product. 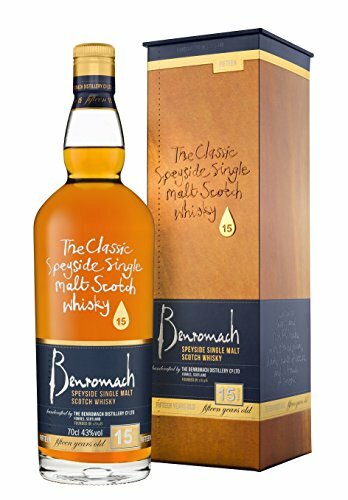 The Single Malt Whiskey Store are proud to offer the excellent Benromach Classic Speyside 15 Years Old Whisky, 70 cl. With so many available right now, it is wise to have a make you can trust. The Benromach Classic Speyside 15 Years Old Whisky, 70 cl is certainly that and will be a great acquisition. For this price, the Benromach Classic Speyside 15 Years Old Whisky, 70 cl is widely recommended and is always a regular choice for most people. Benromach have included some great touches and this equals good value for money. 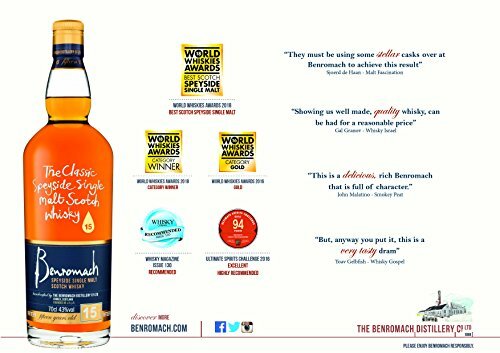 "70cl / 43.0% - A 2015 release to the brilliant Benromach range. The Benromach 15 Year Old is matured in a selection of bourbon and Sherry casks, resulting in an intense but balanced flavour profile. There's big spices (think ginger, mint and a little sprinkle of cinnamon), there's juicy fruit (plum and clementine), there's a touch of smoky charred oak - all well placed and in harmony with each other. Yummers."